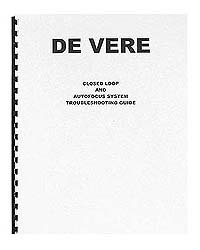 High quality reproduction of the DeVere Closed Loop and Autofocus Systems Troubleshoooting Guide. A very helpful supplement to have at hand when attempting to diagnose malfunctions of either of these electronic systems. This deluxe reproducttion features a comb binding so it will lie flat for easy reference, front and back covers on heavy cover stock, and a clear plastic cover page for added protection and durability. 8½" x 11" format. Comb bound. 51 pages.